Boasting 1782 sq ft and located in the maintenance free, ever-popular gated community of Mira Lago, this 2BR 2BA, plus Den Villa is elegant, spacious, tastefully decorated and comes turnkey furnished! Clerestory windows complement the volume ceilings, steeping the rooms in natural light. Brilliant Oak flooring highlights the Living Room, Dining Room and Den. A tastefully designed eat-in kitchen features white-on-white finishes, granite counter tops, tiled back splash and lighted plant shelves. Split-plan bedrooms offer true privacy and the Master Suite hosts an en suite Master Bath with large walk-in closet, soaking tub, separate shower, dual sink vanity, linen closet and a private commode. There is direct access to the sunny, all-season Florida Room from both the Living Room and Master Bedroom. A brick paver patio has been added at the rear of the home for grilling or outdoor relaxation. Mira Lago features a heated community pool and spa, gated security and several beautiful lakes. Legacy Trail is just around the corner and Siesta Beach is only 5 miles away. 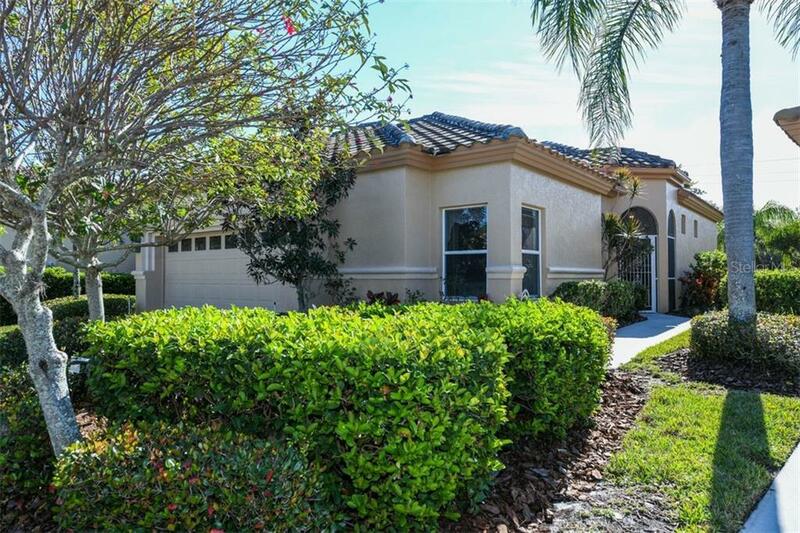 Bring just your suitcase and immediately begin to live your Sarasota dream in this beautiful sought-after community. Pet Restrictions: No size limit. Must be leashed. Cannot be staked in yards, must pick up after pets.